and an array of projects in midstream. for the lovelies that made their way home with me. One of the tasks on my list was to get the cover crops mowed down. and I plan to repeat it in late fall. 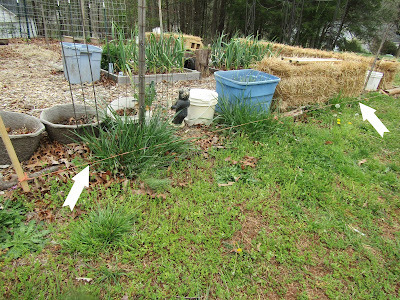 keep weeds at bay, and allow for earlier planting come spring. I used hedge trimmers to do the job quickly. Green beans and cucumbers were planted in two of the four rows. and add a little perty to the beds. These are all companion plants, which is this spring's focus. in order to make it easier for pollinators to find the veg. This is the beginning of the wattle fence project. Big K has been able to get the wooden pieces that will be used as stakes. for the stakes to line up against. I'll have to scratch up some more grapevine or willow branches. has been transformed into a greenhouse. as it gets a good amount of morning light. This week began the sowing of melon and watermelon seeds. Actually, I just noticed last night that the watermelon is up! They will be grown on the arches we created on the northeast side of the garden. so I will lose my greenhouse. The garden is starting to fill with color. the lettuce, kale, chard, peas, leek and cabbage growing in the hugelkultur bed. for a week's worth of salads. The garlic is happy as a clam. and will be fed once more before harvest. The shallots are starting to form flowers. I've read conflicting things about that. and others say to cut off the flowers to encourage energy to the bulb. A call to Extension might be in order. I'll report what I find out. making it through the whole winter with no problem. we got from our local landfill. and is producing quite well. popping up to the right of the kale. the garden should get a good dousing. Less work for the gardener. There will be plenty to do once it's over. How's your spring garden coming along? Your garden looks so beautiful! Another 2-3 weeks and I can get my hands in the soil. I can't wait. :) I've never fertilized my garlic. It's always done really well but I'm happy to know what one to use should I ever need it. With the shallots, I've heard both as well so I usually leave some to collect seeds and the rest I remove the flowers. Honestly, I've never noticed much of a difference between them when I've done this. Hooray for the laundry room! Always exciting to get things moved around in the house. I know you are ready to plant! Hope you get some sunshine your way to warm up that soil!